NO! NO!! NO!! Mars will NOT look as big as the Moon! “No! It won’t happen!! It can’t happen!!! No, not at all. Or, mostly not at all. This began in 2003, when Mars really did make the closest approach in modern human history. But it still just appeared as a bright red star. The original information was meant for stargazers, not really the general public. Through a telescope, at a magnification of 35 power, Mars would appear through the telescope to be about the same size as the Moon with the naked eye (not through the telescope). Comprehendo? The first time it came around, I think it was an honest misunderstanding. Second time, in 2005, might have been another honest misunderstanding. Third time? I sorta think people are deliberately sending this around. But it does give me an excuse to post this again! 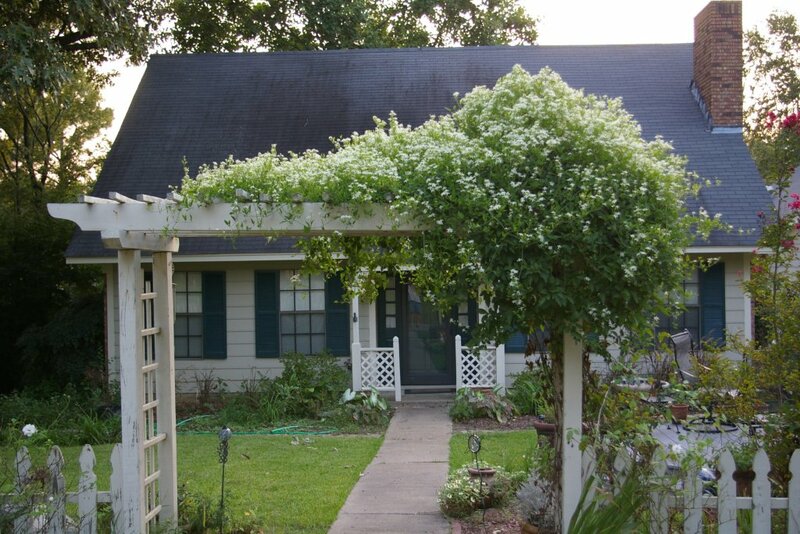 My Sweet Autumn clematis is in full bloom now. I love seeing this in bloom, both because I like the way it looks on the arbor, and because it signifies that we’re near the end of summer and the beginning of autumn. Asters, chrysanthemums, football, and those little candy pumpkins won’t be far behind! 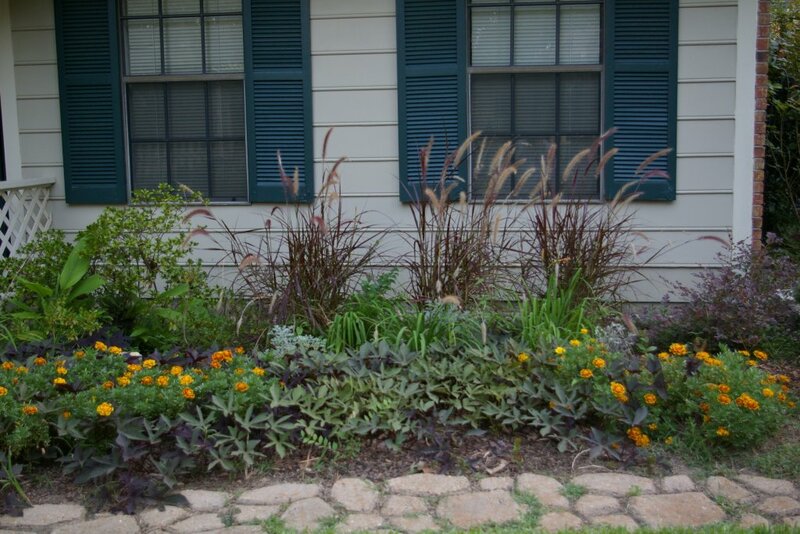 I will probably replaced the purple fountain grass in the back (Penisetum) with something like Panicum virgatum ‘Shenandoah’, and add a couple of perennials like Rudbeckia, but the Blackie sweet potato vine in fron will stay, and maybe even the marigolds – I like the color against Blackie. It looked even better a couple of weeks ago when the orange daylilies were in bloom. I was in the pool Saturday afternoon, cooling off after mowing. At one end I’ve planted crepe myrtles, altheas, and cannas, and since that’s the deeper end, I tend to hang around there when I’m just hanging around in the pool. And while hanging around there Saturday afternoon, I noticed a hummingbird working the cannas. But as I watched, it did something I’ve never noticed a hummer doing. Maybe it was because, with me being in the water, it didn’t notice me. But instead of hovering at the flowers, this hummer would sometimes perch beside the canna flower and sip. I’ve seen hummingbirds perch on limbs and just rest – this one did that several times. But I’ve never seen one feed that way, except for very briefly at a feeder. This one would sit for a couple of minutes at a time, then move on to another flower, where it would sometimes hover, sometimes sit. Neat little birds, those. there was this guy, a sort of aging baby boomer guy, not quite in step with most of those around him. And he had this blog, a sort of little-bit-of-everything-not-much-of-nothing kind of blog, which he updated fairly regularly. And then he sort of stopped, for a little while, which turned into a longer while, until he wasn’t sure if he was still blogging or not. Nearly all of his few regular readers drifted away, because who wants to read a blog that never has anything new? And there was this Facebook thing that broke out of the college campuses and escaped into the wild, and everybody thought it was really cool, and besides all you had to do was type really short posts and comments, and take these quizzes. Facebook was just it. This guy, this formerly-regularly-posting blogger guy, also spent some time on Facebook. Heck, he still does. But Facebook is kind of like walking through the mall. You nod at people who pass (at least, you do this in the South). And if you chance to see an acquaintance, you might even have a brief conversation. Then you move on. Like going to the mall, Facebook gets kinda boring after a while. So, this guy decided to come back to his blog. Just as when he first started it, he doesn’t really know what it’s all about. But if he can just figure out a way to do this regularly, maybe it will come.